Netflix has begun rolling out HDR support for a few smartphones like the LG G6 and the Sony Xperia XZ Premium, in the past few months. 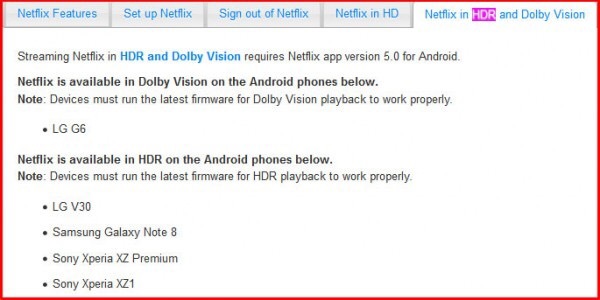 More recently, Netflix has officially provided HDR streaming support for the Sony Xperia XZ1 and the LG V30. Meanwhile, the Galaxy Note8 was the first device to officially support HDR streaming from Samsung mobile. The LG G6 has support for Dolby Vision, but Netflix has neither HDR nor Dolby Vision support for the Samsung Galaxy S8 and S8+ despite having HDR displays with wide-gamut output for reasons unknown.